A daguerreotype was the earliest kind of photograph. When they were first patented in 1839 in France by Louis-Jacques-Mandé Daguerre they quickly became a craze internationally and people rushed to sit for their portrait. These sittings would involve sitting in the sun for at least thirty minutes and the results would be a dark black and white image on a mirror-like background (they were made on a silver coated metallic plate). 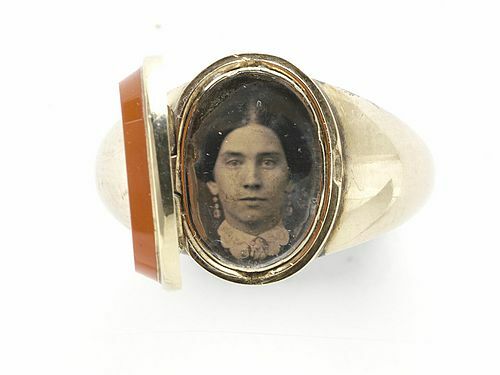 These portraits were made into brooches, pendants, put inside lockets and inside rings. Copies could be made and given to friends and families. The daguerreotype replaced the cameo and painted portrait miniatures which had been so popular before. The daguerreotype was itself replaced in the 1850s by other photographic processes. 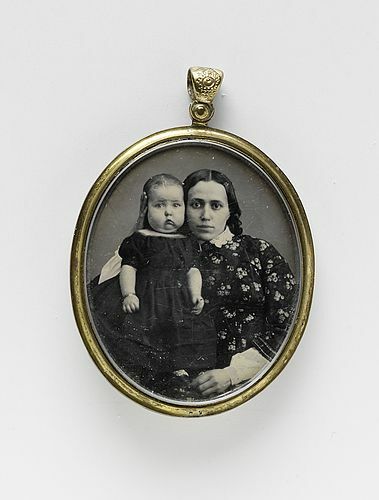 Often combined with hair work, daguerreotypes were considered perfect as sentimental keepsakes as well as to mourn the dead. It’s hard to imagine the fascination they must have held for people who previously had only seen their own likenesses in mirrors. Lockets worn as pendants with daguerreotypes, often with hair inside, soon became the most popular kind of jewelry. 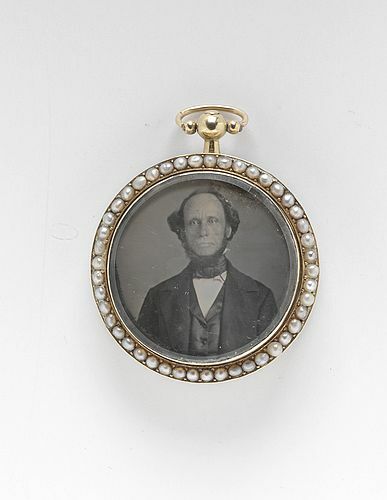 Brooches and lockets could be bought ready made and the daguerreotype could be placed inside. Often, the jewelry piece had an inscription. The image was placed under glass and many different materials were used to create containers for it. These included molded paper and gutta percha and composition. In 1854, a composition case made of shellac, sawdust and color was patented. The jewelry was usually made from pinchbeck, brass or gold. The mirror-like background of a daguerreotype is quite easily recognized so it is therefore quite easy to identify a piece. Because of the relatively short period of time before the daguerreotype was replaced, and because of the quite time-specific fashions of Victorians, it is usually fairly easy to age a daguerreotype. Of course, it must always be considered that the image has been placed in an older or newer piece of jewelry, so other factors should be taken into consideration when evaluating. I think what I find particularly fascinating about the early daguerreotypes is the innocence and awe that seems to often be captured in their faces. The other part that I find so touching is how people would wear each other as decoration regardless of their physical beauty; our era tends to perceive only pretty women and children as decorative, but to the Victorians affection for another human trumped those kinds of considerations. There is almost something intimate about viewing these pieces, as though we can really step back in time and connect on a more personal level with that distant generation whose rich legacy makes us who we are. Perhaps it is for these reasons that daguerreotype jewelry is collected and treasured to this day.